Guide4WDW.com: Top 4 Disney Parks Books You Need In Your Collection! Top 4 Disney Parks Books You Need In Your Collection! Disney is one of those places where you can read and plan all you want to, but you’ll never quite be able to learn and experience it all. Fortunately, authors over the years have compiled various information about the Disney parks in some incredible books to help you learn as much as you can. Now, travel guides are a dime a dozen (I even wrote one myself), but today we’re going to focus a little more on the often overlooked part of the Disney experience, what made the parks what they have become over the years. What happens behind the scenes isn't always released to the public,but thanks to a few select authors, we get a look behind the curtain of the place that has created magic for guests for generations. So, the first book on my list of must reads is one that is rather hard to find in a bookstore, but one of the single best ways to get an idea of what Epcot Center was supposed to become. Notice I said supposed to become. The book contains many ideas that never quite became a reality when the park was completed. Also, due to changes over the years, the title features many attraction that are virtually extinct or already extinct in today’s park. While, that isn't always helpful in planning for future vacations, it’s wonderful to be able to see what used to be, especially for those of us who never got to experience it first-hand in the parks. You get the chance to experience the attractions without actually being there. The designs and story elements of each attraction are there and it truly gives you an inside look at what Epcot was truly designed to be when it first opened. Of course, it was never quite the experience Walt envisioned, but it truly is interesting to see how different today’s park is from the Epcot of years past. Unfortunately, due to the books age, it is often only found in used bookstores or online. Second on the list is possibly the most inclusive of the books on my top 4. However, it is also one of the largest and as a result it rarely fits on shelves of any size. Fortunately, given its size, it does make for an incredible coffee table book. 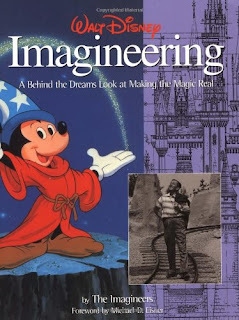 In my opinion, this is one of the best Dinsey Imagineering books ever written. The pictures are incredible and many can only be found within the pages of this particular volume of the title. Years after the first edition, Disney released a similar second version with a similar title, but it is not quite the same. The newer version leaves out some of the history of the attractions and the design elements that make those attractions oh so special. The book itself is one that you could read over and over, hundreds of times, and still find something new each and every time you read it. There’s so much to take in and so much that you may have never seen before, but that bonus may also be a turn off for many readers that aren't quite the Disney fanatic that many of us have grown to be (it is over 190 pages long). The best way to describe the writings of this wonderful production comes from the pages of the book itself. It describes the joy of Imagineering by saying, “The magic rejuvenates the body, stimulates the mind and inspires the spirit. It is a source of happiness and a fountain of learning. The magic is also that feeling of anticipation when something wonderful is about to happen, and the joyous fulfillment of expectation when it does.” Oh, and did I mention the foreword was written by Michael Eisner himself? While this 3rd book is a strange inclusion to a list all about the backstories of the parks and how they came to be, once you experience what the book has to offer, you realize it really isn't all that different. This book, which you can still find new today, has very few words, but hundreds of images created by the Disney artists for feature films in animated form. While the actual text is minimal, the experience of flipping through this “sketchbook” is quite eye opening. The images really show you exactly what goes into an animated film and the immense details and design changes that develop throughout the animation process behind the scenes. From concept art for Beauty and the Beast to scenes straight out of Pinocchio, it’s hard to wrap your mind around the fact that these simple yet incredibly wonderful sketches later lead to the incredible films that have entertained viewers for generations. In my opinion, this is the ultimate coffee table book and something that may become a collectors item down the road. It’s large, just like the aforementioned book, but the size really helps do the drawings justice. You can tell that Disney spared no expense creating the title and the physical quality of the print and binding is quite possibly the best I have experienced. While I am a little biased in favor of animation, it really is a book that many people will enjoy and one that holds a special place in my personal collection, just as each of the other books listed do as well. While I contemplated leaving this book off the list due to it’s immense detail and over the top architectural terminology, I realized that many of you may be like me and have a fascination for the little details that end up making the biggest differences in the Disney parks. With that being said, this is truly one of the best books written for those of us who truly enjoy seeing “how it was done”. The book features never before seen artwork and construction plans for various attractions and buildings across the various Disney parks and resorts, but also delves into the unique details that many of us truly overlook. Strangely, that is the design. Everything is just meant to fit together in just a way that you don't see anything that appears to be out of place or out of the ordinary in the parks themselves. With everything from the color scheme of attractions to the more elaborate design elements and stories that created the Disney iconic attractions, this book has all of the details a certain Disney enthusiast will undoubtedly enjoy (you know who you are). I’m happy to admit, I am one of those people, and this book has ended up in my collection for both research purposes and for solely the joy of reading about elements of the parks that are often never talked about. Unfortunately, it is one of the more expensive books, and one that is fairly hard to find in used bookstores (thankfully amazon has a few available for sale). So, which one these books has been added to your wish list? There’s more books on my list for sure, but let us know if you enjoy this post and we’d be happy to write another Disney books post in the near future! Thanks for reading and be sure to share the article with friends on social media!